Sweet Princess Bowtique's headbands are made for all types of princesses!! 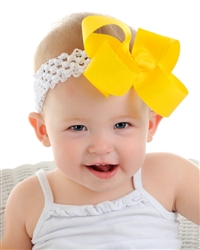 We have a large assortment of ADORABLE headbands that will look so sweet on your infant baby girl or toddler girl! Each one of our baby headbands comes in a variety of different styles and sizes of headbands including...super soft cotton headbands, stretchy crochet headbands, ultra comfortable nylon headbands and elastic headbands! Click on the categories below to view our HUGE assortment of unique baby headbands!